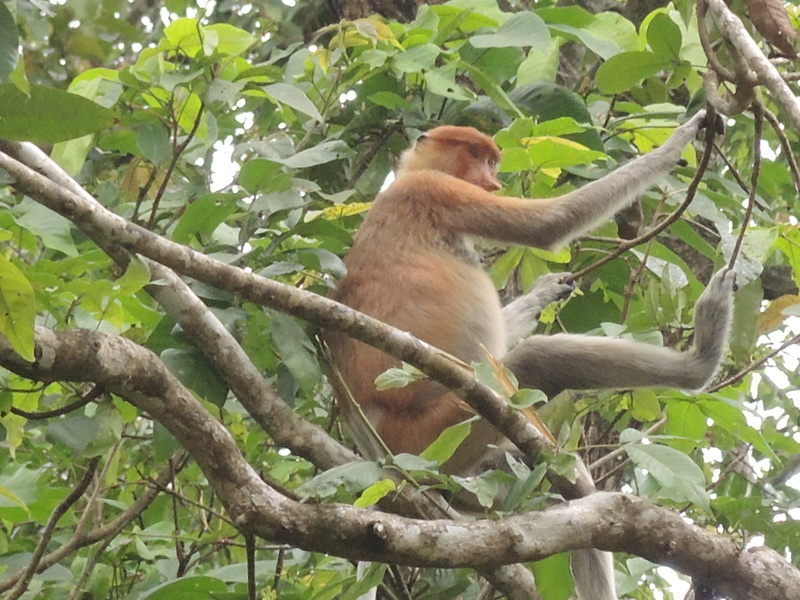 A proboscis monkey, called bekantan in Malay. I kept trying to get a clear photo of his long nose, but as you can see he was bashful. Photo taken from the Kinabatangan River. This entry was posted in Travel Photos and tagged 50 Year Project, Animals, Asia, bekantan, Borneo, Kinabatangan River, Life, Malay, Malaysia, Monkeys, Nature, Photography, Proboscis monkey, South East Asia, Travel, Travel Blog, Travel Journal, Travel Photo, Wildlife. Bookmark the permalink. They do look very different from others. Yes they are. It was fun watching them, but so hard to get a photo. They kept jumping around in the trees. He looks like he has been eating well. Were you allowed to feed them? Nope. These live in the wild. I wonder what they eat. and his is smaller than the lead male. Beautiful creature. Nature is amazing! Isn’t he cool. I love seeing the variety in nature. His oddness makes him stunning. Maybe he was also tired of having so many little boxes..some with blinding light flashes…pointed at him. Cool shot and what a neat experience to see one of these! It would be annoying to have so many humans snapping pictures.